Ganache, at its simplest, is a blend of chocolate and cream. While fluid, it can be poured and used as a glaze or sauce; chilled or allowed to sit until thick, it can be spread or piped. 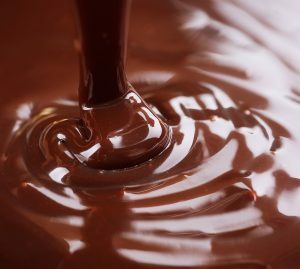 The flavor and ultimate texture of the ganache will greatly depend on which semisweet or bittersweet chocolate you use; I don’t think of any as “better” than any other – use a chocolate whose flavor you enjoy and you will like the ganache made with it. Experiment as different chocolates will not only lend a particular flavor to the ganache but the texture will vary as well. Place cream in a medium saucepan and bring to a boil over medium heat. Remove from the heat and immediately sprinkle chocolate into cream. Cover and allow to sit for 5 minutes. The heat of the cream should melt the chocolate. Gently stir the ganache until smooth. If the chocolate is not completely melted, place over a very low heat, stirring often, until melted, taking care not to scorch chocolate. The ganache is ready to use. You may pour it over cakes as a glaze, or, you may allow ganache to firm up overnight at room temperature or until it is a spreadable consistency (between mayonnaise and peanut butter). Refrigerate up to 1 week in an airtight container or freeze up to 1 month. You may re-warm ganache to its fluid state on low power in microwave or over very low heat in a saucepan. Tip: I cannot overemphasize the fact that your choice of chocolate will literally make or break this recipe; often when using higher cocoa percentage chocolates the ganache will “break” and refuse to come together into a smooth mass. It might look curdled and cocoa butter will separate, float to the top and create a grease slick. Whisk in some extra cold cream and/or buzz it with an immersion blender (if you have one) and it should come together. It is simply a matter of chocolate/cream proportions, so do not give up. Also, if the ganache is overheated, the same textural problems can arise, but the solutions remain the same.